For the third consecutive week, the Liberal Redskins trailed at the half but rallied to win the game. This is becoming a theme to the 2017 Redskins. This time they spoiled Dodge City’s senior night with the 34-29 win on a blustery evening at Dodge City Memorial Stadium. LHS trailed 29-27 with 2:24 to play, no time outs, and knowing they had to work against the wind which was gusting over 40 miles per hour. But Syris Dunlap lofted a pass against the wind and over the Dodge City defenders and into the hands of Tyrique Chandler for a 42 yard touchdown on a fourth down play with 15 seconds remaining. It was Liberal’s third fourth down conversion of the drive. Dodge City scored first as Jaiel Johnson raced 40 yards for a score at the 9:18 mark. Dunlaps six yard run with 5:21 to play tied the score. After a bad snap on a Red Demon field goal attempt, LHS had a chance for a goal line stand against DCHS. However, LHS was flagged for a face mask penalty and that allowed Dodge City’s Carlos Fernandez to kick a 24 yard field goal to take a 10-7 lead at the end of one quarter. Without the injured Beau Foster, Dawson Williams stepped in to play quarterback and scored a three yard touchdown to lead 17-7 with 7:43 to play in the first half. Dunlap’s 41 yard run with 6:44 answered to make it 17-14 Demons. Dodge City punted against the wind late in the half but recovered their own punt which did not travel past the line of scrimmage. The Demons advanced the ball from the DC 39 to the Liberal 15. But LHS held Dodge City out of the endzone. The Redskins appeared to have the Demons on their heels to begin the second half as Cesar Burciaga intercepted a screen pass and took it to the Demon one. Burciaga would score offensive from a yard out to take a 21-17 lead with 10:10 to play in the third. Burciaga’s 16 yard run with 6:05 to go in the third gave LHS a 27-17 lead. Liberal was called for a penalty on the PAT and then had a bad snap on the second PAT attempt. Williams three yard run with 1:57 to play in the third made it 27-23 after Tyrique Chandler and Jesse Alverado blocked the kick. Dodge City kicked against the win and recovered their own kick due to the wind. LHS held the Demons and got the ball back but the Redskins were stopped on fourth down at Liberal’s 45 which changed the momentum of the game to DCHS. Williams scored from one yard out to lead 29-27 with 2:24 to play. Dunlap hit Chandler for the pass with 15 second left to shock the crowd in Dodge City. Syris Dunlap rushed 188 yards for Liberal and Burciaga had 81 on the ground. 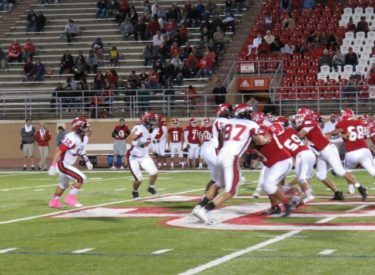 Liberal put us 352 yards of offense while Dodge City had 337 led by Williams 243 yards. Liberal is 6-2 and finishes 2-2 in the WAC. This marks the first season the Redskins have one multiple WAC games since 2008 when they were 2-2. It’s Liberal’s first win over Dodge City since 2013. LHS is 4-0 on the road. Dodge City is 3-5 and 1-3 in the WAC. The Redskins are the #4 seed in 5A West and play the #13 seed 2-6 Salina South Cougars Friday night at 7 with Redskin Pre-game at 6 on 1270 and kscbnews.net.